Pass SAS Big Data Professional (A00-220 and A00-221) Certification exam with our premium practice exam. With tons of experience in the field of SAS analytics, our expert panel has designed this practice exam which completely simulates the SAS Certified Big Data Professional Using SAS 9 exam pattern and format. We at AnalyticsExam.com, have maintained exam structure, time limit and marking system same as SAS Certification. Our experts have included more practical questions which are the most frequently asked in SAS Certified Big Data Professional Using SAS 9 Certification. 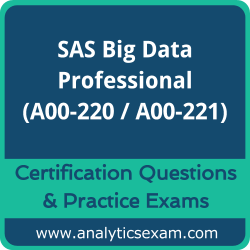 The sample exam has basic A00-220 and A00-221 questions related to SAS Big Data Professional Certification; you may find scenario based questions in your SAS Certified Big Data Professional Certification exam which needs more dedication and attentions to understand each question. That is why we strongly recommend you to practice with our premium SAS Certified Big Data Professional Using SAS 9 Certification practice exam. Why should you choose us for SAS A00-220 and A00-221 practice exam? Our online practice exam is a simulation of SAS Big Data Professional (A00-220 and A00-221) Certification exam which allows you to complete within the time limit. We offer an unlimited attempt to practice our online exam. Each exam will fetch random questions from our 60+ AND 75+ most probable premium questions set prepared by our experts. You can view your result of each exam and performance history of your past attempts. Such facilities are a great advancement over A00-220 and A00-221 questions set in PDF and far better than fraud dumps sites. According to our survey with certified candidates, you can easily score 85% in your SAS Certified Big Data Professional Certification if you can score 100% in our online mock exams. Its been a good journey with this practice test, good portal and very nicely designed practise exam with correct and required questions.